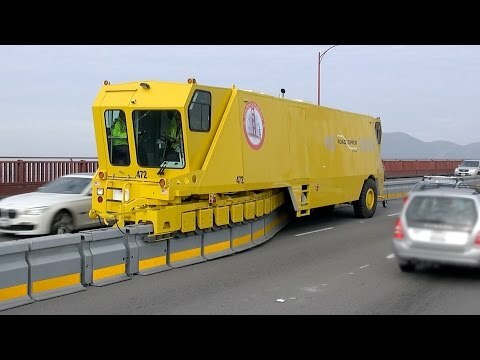 Some closeups of the Barrier Transfer Machine (BTM) repositioning the new Moveable Median Barrier (MMB) on the Golden Gate Bridge at the tail end of its Thursday morning run on January 15, 2015. It started at the northern (Marin) end and this video is of it reaching the end of its run at the southern (San Francisco) end, near the toll plaza. The new Moveable Median Barrier (MMB) system is about 13,340 feet of 12-inch wide and 32-inch high steel clad units filled with high density concrete pinned together to form a semi-rigid median barrier. There are two barrier transfer machines, aka “zipper” trucks. This replaces, and is a vast improvement over, the old yellow plastic pylon divider system, which you can see still in partial use here to block off some lanes at the toll plaza. 100 cool ideas products of wood! Bed! Amazing Table made of Aluminum Foil.